Just a few of the many types of salmon flies that have been made over the ages. 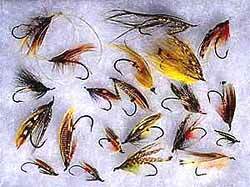 This picture shows some styles of salmon flies that have been used through the ages. It does not show them all by any means. It's interesting to note how little things have actually changed, what fish could tell the difference?. Compare the 'Undertaker' and 'Rusty Rat' tied recently by Warren Duncan of St John NB, Canada with the two flies at the top left hand corner. I found them in a wallet dated 1790 so they might well be 200 years old. It seems that the salmon fly has maybe not developed as much as we might think! Some of these patterns are instantly recognisable, others I have been unable to trace in any of my reference books. If you can name them all I would be delighted to hear from you. All I can tell you is that except for the two that Warren Duncan made, to the best of my knowledge they are all of Scottish origin. Amongst them are Jock Scott, Dusty Miller, Silver Wilkinson, Black Doctor, Yellow Eagle, Golden Parson, Black Heron, Kate, Silver Grey, Sweep, Undertaker and Rusty Rat. There are also a variety of hook styles, up eyed, down eyed, limerick, Bartleet, gut eyed, hand made and two examples of the original light wire Wilson LW single irons tied in classical Cairnton style where the body is half the shank length. Click here to learn of various types of flies used for salmon fishing. There are of course a huge number of hook styles available nowadays and many that have fallen from fashion, never to be repeated. As examples I have shown a couple of interesting hooks. 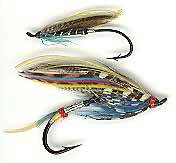 The top fly, a classical style Blue Charm has a double barbed hook - no thoughts of catch and release in those days! The lower fly, a Silver Doctor has an articulated hook designed to prevent leverage during playing the fish and it looks like it would be a very inefficient hooking device.